Dortmund - It was 29 March 2014, FC Bayern München had already wrapped up the Bundesliga title in record time and their 3-3 draw with TSG 1899 Hoffenheim was something of an exhibition match; a show for the spectators. Everything was perfect on a spring afternoon in Bavaria. Almost everything. The headline that day was not the fact that Bayern had surprisingly dropped points at the Allianz Arena, that Hoffenheim's leaky defence and menacing attack had done itself justice, or that Bayern's record run of 19 consecutive Bundesliga wins had been brought to an end. The main news was exclusively negative: Thiago Alcantara had torn ligaments in his knee. After the game, Bayern suggested a break of six to eight weeks for the Spanish midfielder. "It's very bad news and we will miss him badly," said head coach Pep Guardiola, while midfielder Thomas Müller added, "It's really disappointing and it comes at a catastrophic time for us, right before a lot of important matches". It turned out to be more than just six to eight weeks, though. 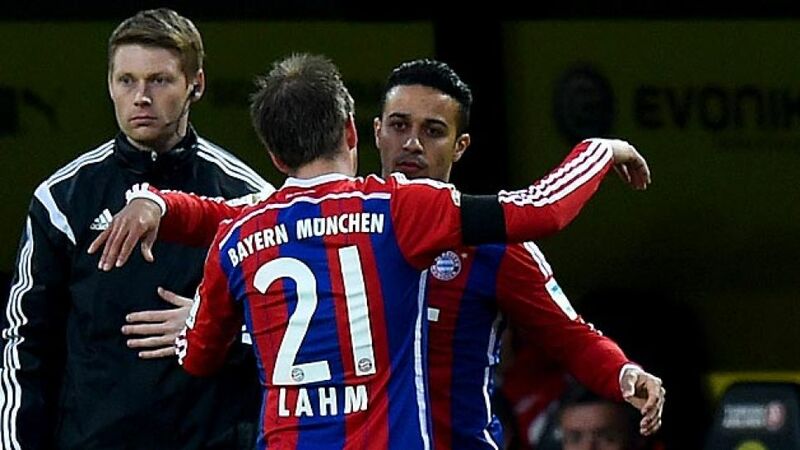 More than a year later, Thiago made his return to action only on Matchday 27 in a 1-0 win at Borussia Dortmund. It was a "very emotional moment" for the Spaniard to return to the field of play after such a long and hard time - an eternity for a professional footballer. "It was difficult because I couldn't count the days - I was counting months," Thiago said. "So it was tough. Every day was like the next final. I fought my way there and now I've got to enjoy it. I don’t have to fight anymore, I just have to enjoy it." Thiago missed all manner of important games for his club, as well as the 2014 FIFA World Cup for his country, and so it comes as no surprise that the longevity of his absence was matched by the sheer relief he felt at making his return. "As a footballer, we live for this," said the Spaniard. "It's been a long and difficult year, but now I'm back. I don't have the words to describe it. Football for people is just a game, but you can see from the crowd how emotional they are so it's more than that - it's not about a game, it's life." The 23-year-old thanked all of his support crew, from team-mates, friends, doctors and coaches to the fans who have wished him well along his long and winding road to recovery. "We're always together as a team and I have to thank everybody," he said. "Now the value of everything is greater. You spend one year off and can now enjoy it again. It's a special moment."